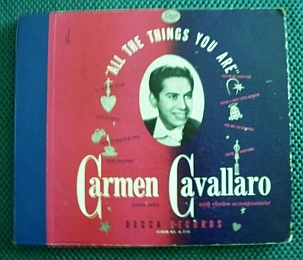 Here is an album of four double sided 78 RPM records by Carmen Cavallaro. Piano Solos with Rhythm Accompaniment. The center holes are in good condition. The album cover is in good condition with the usual minor tears and scuffs along the edges and corners. The spine is in good condition with only minor scuffs and small tear at the top.